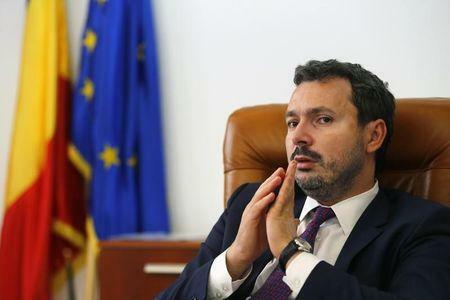 BUCHAREST (Reuters) - Romania's finance and energy ministers lost their posts in a reshuffle on Sunday, expected to strengthen the governing center coalition's hold on power by giving it another political ally in the cabinet. Two senior sources in the ruling Social Democrats (PSD) party's National Executive Committee told Reuters Finance Minister Ioana Petrescu had been removed, with her portfolio being taken by Budget Minister and ruling party member Darius Valcov, and the two ministries merged. "Ioana Petrescu will be replaced by Valcov," one source said, while another said by text message she had lost her post to Valcov. Energy Minister Razvan Nicolescu, a technocrat whose team drafted Romania's investment-heavy energy strategy for 2015-2035, was also removed having only taken office in March. No replacement has yet been named. Petrescu, who has a PhD in Economics from Harvard University and is not a member of any party, had been an economic adviser to Prime Minister Victor Ponta. Until the reshuffle, due to be approved by parliament next week, the finance minister position had been less powerful than in other countries, as the job's responsibilities were diluted in 2012 with the creation of a separate budget minister. Valcov had completed talks with the International Monetary Fund earlier this week by agreeing a fiscal deficit target of 1.8 percent of gross domestic product against this year's 2.2 percent goal. Ponta's coalition had been weakened by the departure of the ethnic Hungarian UDMR party after he unexpectedly lost a presidential election on Nov. 16. That prompted long-term Ponta allies, the Liberal Reformists, to lobby for cabinet posts, and the centrist party is expected to be awarded the energy portfolio. Nicolescu, whose team engineered the stock market flotation of power utility Electrica, urged the government to continue market-oriented reforms, finalize its long-term energy strategy and depoliticise state-controlled companies. European Union member Romania is one of the most energy-independent countries on the continent and is a net exporter of power, although it must import oil and some of its gas. Foreign firms have complained about sudden shifts in government policy in Romania, which has been gradually deregulating its power and gas tariffs. Nicolescu, who is chairman of the board of directors of the European Agency for the Cooperation of Energy Regulators (ACER), said he would run for a leadership position at the International Energy Agency.